January 13, 2017 by David Shields. Average Reading Time: about 7 minutes. Charles Henry Tubbs, a type maker for William Page and a founding partner of the American Wood Type Co, was born January 13, 1842, in New York City to Joseph Tubbs and Jane Sloat. When ill health caused Joseph Tubbs, a brick and stone mason, to retire from his successful contractor and building business in New York City, he moved the family to a farm between Lisbon and Hanover, Connecticut. Here Charles spent his childhood. In his youth, Charles Tubbs went to school and helped work on the family’s farm. In 1856, his father passed away. Sometime between 1856–1859 his mother, Jane moved the family seven miles south to Norwich, Connecticut where she ran a boarding house. Charles entered into an apprenticeship as a painter with his uncle, William Tubbs, starting at the age of 17. This apprenticeship appeared to have been short-lived, as soon after he was hired, as a type maker, by William Page of the William H. Page & Co in Greenville, Connecticut. Rob Roy Kelly1 indicated that Tubbs started with Page in 1860. The Norwich City Directory didn’t list Tubbs until 1862 when it showed him living at his mother’s boarding house on Franklin Street. The discrepancy may be accounted for in A Modern History of Windham County, Connecticut where it stated that shortly after being hired by William Page, Tubbs “spent a year in New York city but afterward returned to Norwich and took up the business of steel engraving in connection with wooden type manufacturing.”2 It is interesting to note that Tubbs was listed as an engraver by the Norwich City Directory the last five years of his employment with Page. Charles Tubbs and Josephine Pollard were married April 26, 1863, in Norwich, Connecticut. Their son George Carder Tubbs was born in January 1865. Josephine would die sometime in the late 1860s3. In May 1870, Charles married Helen Kershaw Dunkerley. Their son Herbert Henry Tubbs was born in May 1872. The 1870 Federal Census listed Charles and Helen (Nellie) boarding with John Martin and his family along with Carrie Burdick, just next door to George Kies and his family (Kies was married to John Martin’s sister Julia). 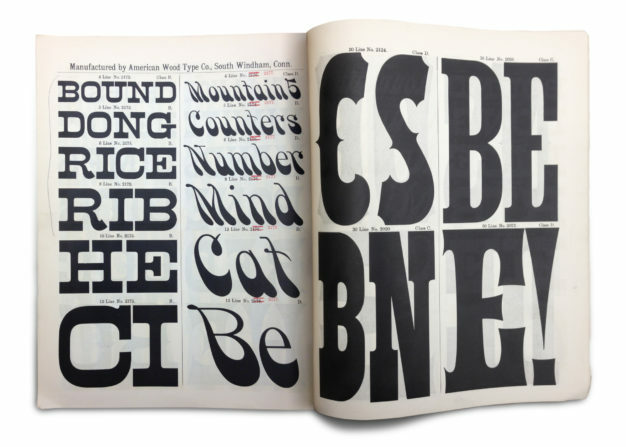 Charles Tubbs, John Martin, George Kies — all type makers (designers) — and Carrie Burdick — a type cutter — worked for William Page. Tuscan Extended, a face very likely designed by Charles Tubbs, one of seven type makers working for William Page in 1867. This from the 1867 Wm H Page & Co’s Specimens of Wood Type, manufactured at Greenville, Conn., held in the Kemble Collections on Western Printing and Publishing, California Historical Society. Charles Tubbs, John Martin, and George Kies left the William H Page Wood Type Co in 1878 to start American Wood Type Co. They moved into the factory in South Windham, Connecticut originally built and used by Edwin Allen to manufacture wood type 1837–1852. The partners seemed to have had the good will of William Page, as they set up shop with three cutting machines4 and nearly 200 type patterns5. American Wood Type Co’s first catalog of 1879 Specimens of Wood Type Manufactured by the American Wood Type Co showed 26 different type styles with a number of borders and ornaments. 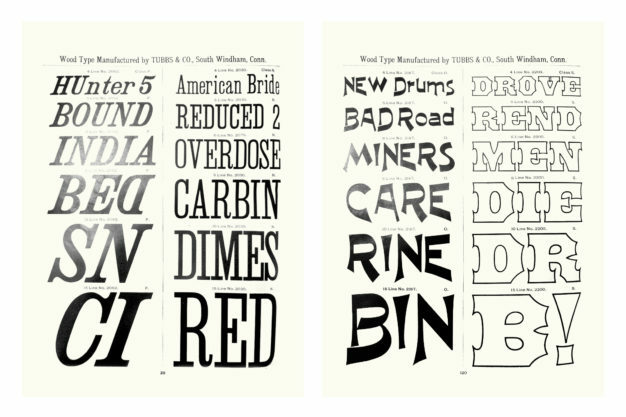 All of the types and borders in the catalog followed William H Page Wood Type Co’s designs. 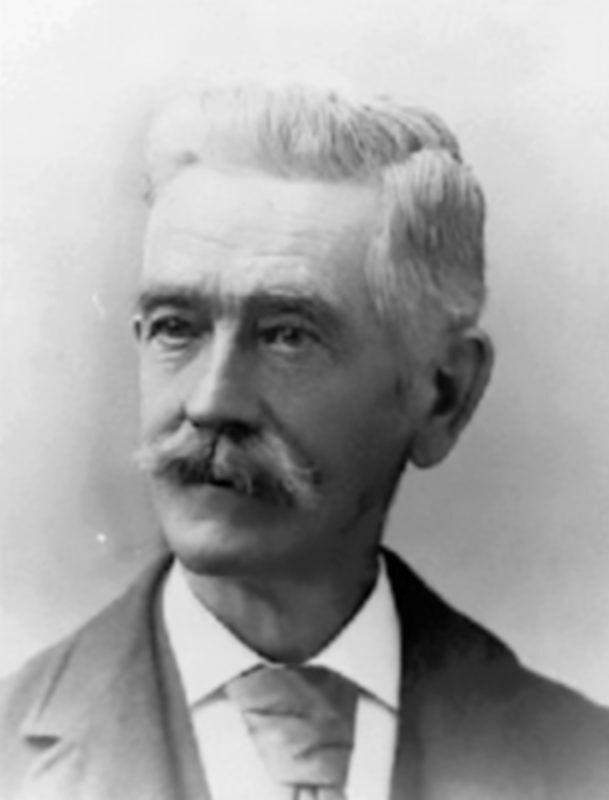 In May 1883, Charles Tubbs bought out the interests of Martin6 and Kies7 and took sole ownership of the company. He continued the company under its original name. There is little-known information available on the activities of Tubbs or the American Wood Type Company for the next two decades. Rob Roy Kelly indicated that the company employed 17 people during this period8. Two subtly different specimen catalogs were published in the mid-1880s that marked a transition from a type naming system to a type numbering system used by the company. George Carder Tubbs9, Charles’ son by his first marriage was a wood type cutter for American Wood Type Co as of 1887, and was also an employee again 1895–1897. Herbert Henry Tubbs10, Charles’ son by his second marriage, was also an employee of the American Wood Type Co 1890–1904, though it is not clear the nature of his work for the company. 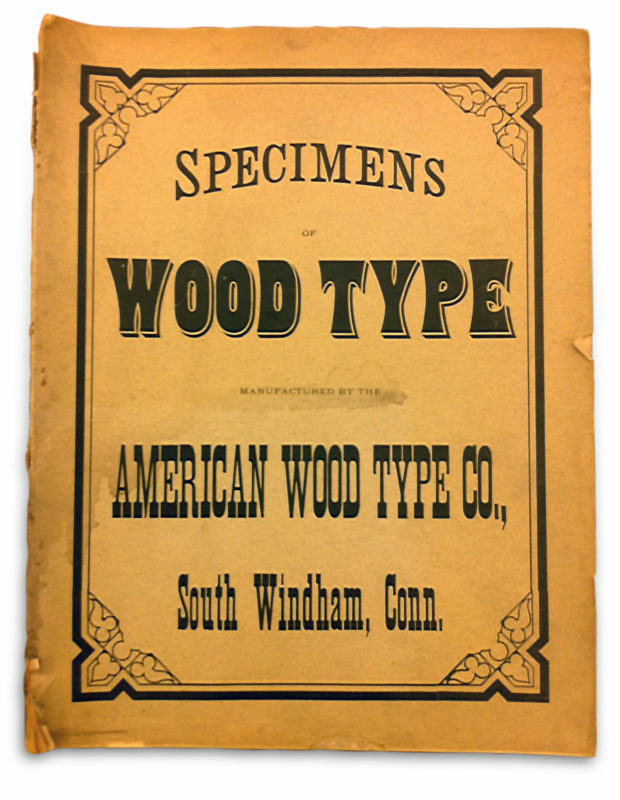 In 1902, American Wood Type Co became Tubbs & Co of South Windham, Connecticut. Charles Tubbs was still in charge of the company and no other changes to the company are yet know. A new specimen catalog was released sometime in 1903. In December 1904, four men bought all interests in Tubbs & Co from Charles. Kaufmann11, Kurtz12, Bashelier13, and an (as yet) unnamed Type Designer14, renamed the company the Tubbs Mfg Co and moved all equipment and materials to Ludington, Michigan15. 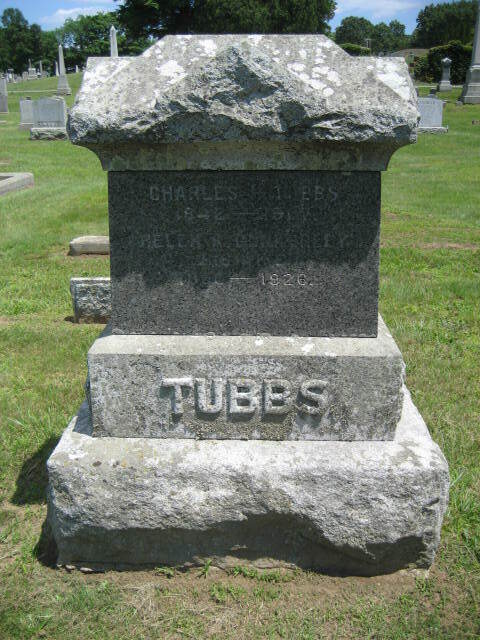 Charles Tubbs lived out his retirement with his wife Nellie at their home in South Windham. He passed away, November 2, 1907, and is buried in Windham Cemetery. She died in 1926 and is buried with him on the family plot.